Today’s job market is extremely competitive. Recruiters are looking for not only highly-qualified individuals, but also jobseekers who complement a company’s culture. To stand out from the rest of the applicant pack, you need a strong resume tailored to each new job opportunity. Employers want to know you took the time research the opening and think about why you are the perfect fit. This is a daunting prospect, especially when you’re up against so many worthy candidates. During the writing process, it can be helpful to use editable resume templates to get organized. Our custom resume templates can help you optimize your document with industry-specific information in a recruiter-friendly format. They also ensure you make a lasting impression by mirroring your skills to unique job duties. Why Use Editable Resume Templates? According to career experts, 90% of jobseekers fail to customize their resumes for different hiring managers. Instead, they create something that sounds vaguely professional but provides no insight on how their skills fit the job’s demands or the company’s brand. Understand the appropriate resume length and format for your career and experiences. 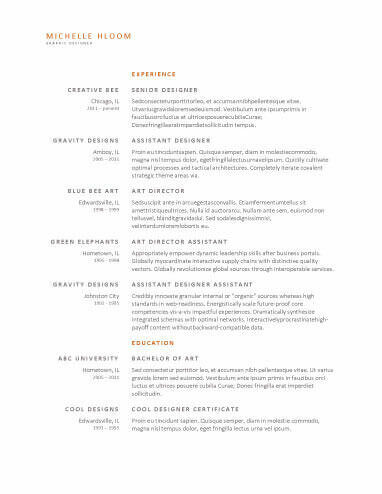 If you work in marketing, writing, graphic design, theater, or another artistic industry, you have the freedom to make an aesthetic statement with your resume. Break out of the black-and-white box and showcase your individual style with our colorful Creative Resume Library and editable resume templates. Remember to consider your audience, though, as a non-traditional document may not be appropriate in every scenario. No matter what your field is, whether you are an entry-level accountant or an established lawyer, you can never go wrong with a well-organized, traditional resume. Our editable resume templates come in several sleek layouts with easy-to-read sections. These minimalist designs put a major focus on your experience and skills, which is an advantage for jobseekers in all industries. Are you a recent graduate or first-time jobseeker? If so, you’ll want to create a resume that puts an emphasis on your skills and accomplishments. Hiring managers often look for candidates with proven job experience, but you can sway them with a compelling portfolio. Not sure where to start? Reference our editable resume templates and entry-level examples for inspiration. Unless you have extensive experience, a one-page resume is an excellent choice. A single-page document makes a great visual impact on recruiters and is easy to skim. Entry-level jobseekers, new graduates, and those making a switch in their careers can all benefit from a concise, yet powerful resume. Click here to learn more about chronological, functional, and combination styles and how to leverage each for your specific situation. Although many people consider a one-page resume to be the standard, there are scenarios in which a longer document is appropriate. When you have more than a decade of work experience or extensive technical training, a two-page resume is ideal. Attempting to fit detailed credentials onto one page puts you at risk of leaving out important information or creating a crowded document. Kick off your resume with well-formatted contact information. Start with your full first and last name. Then, provide current details such as your phone number and email address. Make sure your address sounds professional, ideally with your name in it. Avoid listing work accounts and any that may have a negative connotation. When mentioning your geographic location, it is not necessary to list your entire address; city and state work fine. If applicable, feel free to include links to your social media accounts and website. Next, capture the attention of recruiters with a strong summary statement. This section should be no longer than six lines of text. Here, you should give a succinct overview of your most impressive achievements, work experience, and skills. Remember to write "years of experience" or "years’ experience." Never write "years experience." Optimize your skills section by incorporating desired qualities from the job description. Adapt your document to each position to which you apply, showing that your strengths fit in with the company’s unique needs. Include no more than eight bullet points of your most relevant soft skills and technical abilities. Create subsections for each of your past roles. List your title, the company’s name, location, and dates of employment. You can list either month and year, or just year; however, you should be consistent. Then, include five to eight bullet points detailing a mix of duties and accomplishments. Wherever possible, use numbers and metrics to quantify your successes. Showcase your academic experience by listing each degree and school you attended. Include the location and dates, along with any honors or relevant extracurricular involvement. It is not necessary to include your GPA unless you are a recent grad. * Choose from several effective resume layouts. * Share relevant information about yourself. * Select a template based on your experience and goals. * Plug and play with an extensive variety of industry-tailored bullet points. Then, simply download and watch your job search blossom before your eyes. Feel free to design multiple resume versions to give to different hiring managers. Because the process takes only minutes, you can churn out customized resumes for each role to which you apply. Good luck!